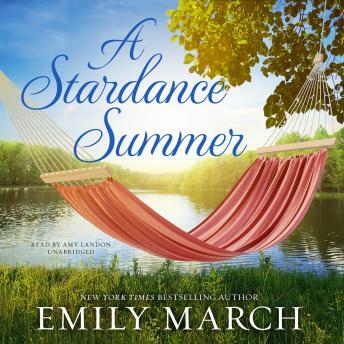 Return to the beloved small town of Eternity Springs in the newest installment of Emily March's New York Times bestselling series with A Stardance Summer. Brick Callahan enjoys every minute of chaos at his campground, Stardance Ranch, especially after the Tornado Alleycats arrive for an extended summer stay. The members of the all-female glamorous camping club are primarily seniors?active and adventurous, friendly and fun. But when he discovers Liliana Howe frolicking with the glamping grannies in a late night skinny-dipping session, he fears he's in for a summer of trouble. Because his best friend's kid sister has grown up to be drop-dead gorgeous. Betrayed by those she trusted, Lili decides she's put her career first for too long. She sells her practical sedan, buys a travel trailer, and heads to Eternity Springs for a summer of rest, relaxation, and reassessment as the newest member of the Alleycats. The last person she expects to find running an RV resort is her high school crush. Their undeniable mutual attraction is a reminder that life is full of surprises. But when the past comes calling, will their summer romance stand the test of time?